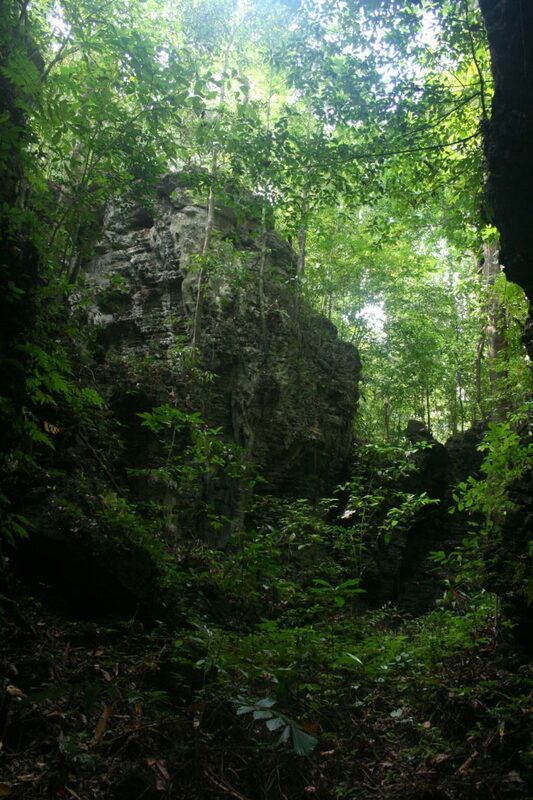 The karstland ecosystem in Baratang in the Andaman and Nicobar Islands supports a unique biological diversity among limestone rocks, gullies and sinkholes. A new study sheds light on the vegetation composition of this ecosystem, and highlights the need for conservation. These forests are vulnerable to human intervention, climate change, tsunamis and tropical cyclones. Among the jagged rocks, sinkholes and caves carved out of limestone, Baratang in the Andaman and Nicobar Islands also houses a species-rich, diverse forest that is quite different from the surrounding tropical evergreen forest typical of the inland areas of the islands. A new study has shed light on the vegetation composition and diversity of this unique forest. The karstland ecosystem hosts exclusive patterns of vegetation with a high richness of tree species, highlighting the need for greater understanding of these distinct ecosystems and conservation in the face of growing pressures, the study has found. Constituting around 12 percent of the Earth’s land, karst is a unique landscape—featuring jagged rocks, crevices, sinkholes, and underground caves—formed by the dissolution of soluble rocks such as limestone and dolomite by rainwater. Karstland is also found in other parts of India such as the Ananthagiri hills in Andhra Pradesh, the Himalayas in Uttarakhand, Pachmarhi in Madhya Pradesh and Bastar in Chhattisgarh, said ornithologist Akshaya Mohan Mane, lead author of the study from the Bombay Natural History Society. This baseline study on karstland forests from the Andaman Islands paves the way for more detailed studies to understand how the karst substrate influences vegetation diversity. “Karst and caves were explored mainly for mining in India and then for tourism,” and until now little attention has been given specifically to karstland vegetation in India, said Mane. This vegetation survey was conducted in the limestone karstland of Baratang Island, which is situated in the southernmost part of the North and Middle Andaman District. Part of the Indo-Burma global biodiversity hotspot, the Andaman and Nicobar Islands’ forests are typically tropical evergreen and semi-evergreen. Akshaya Mane and her team at Baratang Island’s karstland forests. Photo by special arrangement. Baratang’s limestone karst area houses the biggest underground cave complex of the Andaman and Nicobar Islands, with more than 175 limestone caves spread over less than one square kilometre. At an elevation up to around 76 metres from sea level, the terrain features rugged rocks, clefts, crevices, and tunnels. Dividing the study area into 100 by 100 metre grids, the team sampled smaller plots within these grids enumerating trees, saplings, and seedlings. The findings showed that the karstland region hosted high species richness with 90 tree species, as against 25 to 84 counted in previous studies in other parts of the Andaman Islands. Such high species richness is partly because of the inaccessibility of the terrain and low levels and frequency of human disturbance, explained the authors. Notably, nearly 50 percent of the tree species were encountered by the team ‘rarely’ as they were present only in one or two plots. Moreover, 50 percent of the species were represented by only one or two individuals. The high species diversity on the karstland is also one of the reasons why there are more rare species observed in the area, the authors pointed out. About 17 percent of the total species surveyed in the study area were found to be endemic or exclusive to the Andaman and Nicobar Islands. Compared to other studies in nearby islands where endemism ranges between 8 and 15 percent, the endemism in karstland vegetation is higher, noted the authors, but it is consistent with the overall endemism in the Andaman and Nicobar Islands which stands at 17 percent. Interestingly, the dominant and co-dominant species in this ecosystem were distinct from non-karstic areas studied in the Andaman Islands. The most abundant and frequently encountered tree species was Celtis philippensis, which comprised 16 percent of individuals. But in other parts of the Andaman Islands, species such as Dipterocarpus sp., Myristica sp., and Pterocarpus dalbergioides dominated. Karstland vegetation of Baratang Island grows on rugged and fragile terrain at elevations up to 76 metres from sea level. Photo by Akshaya Mane. Many tree species found in the Andaman Islands may find the rugged karstland terrain with shallow soil inhospitable. The “exclusive vegetation patterns” found in the study “might prove a useful tool while understanding fast-changing, sensitive karst ecosystems, said Mane. Conserving karstland vegetation will also help preserve its fauna because it influences the unique subterranean biodiversity in the caves below, which harbor a myriad of endemic fauna from birds and bats to insects and fish. 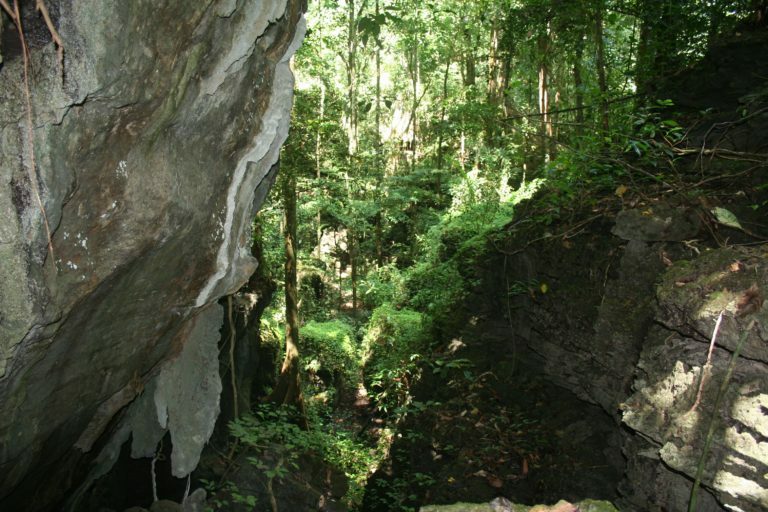 Some endemic species found in the caves of the region include a subspecies of the edible-nest swiftlet, Andaman horseshoe bats, and Andaman barn owls. Apart from supporting a unique and diverse fauna, karstland vegetation has a role in reducing surface water runoff and recharging groundwater, the authors stressed. The fragile terrain and tree stands at the Baratang karst forest. Photo by Akshaya Mane. “Understanding the role of the karstland forest and its dynamics in maintaining the karstic landscape and the groundwater recharge can contribute to face the water crisis in different regions, especially the Islands with limited water resources,” they state. The team also calls for the long-term monitoring of karstland forests for their ability to regulate climate.